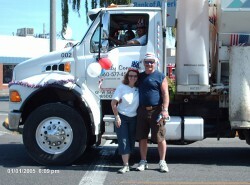 Specialty Concrete is locally owned and operated in Kelso WA. We’ve been in the business for over 15 years (we bought the company 4 years ago). We can do small or large pours-we have 3 trucks to serve your needs with the capability to deliver 26 yards in one delivery. With Specialty Concrete, there is no waste—you are billed for only what you use! If you use less than what you ordered, that’s all you pay for. If you need a little more, our trucks always carry an extra ½ yard. Believe it or not, using our delivery service is less expensive than mixing your own, and with no hard labor or mess to deal with! There is no job too big or too small—whether you are pouring a small patio or building your dream home, we can provide you with just what you need. Our crew has loads of experience in the concrete and construction industry. Our goal is to provide you with quality fresh concrete delivered to your job site, on time. Our drivers are the best in the industry, and we couldn’t be more proud to have this team to service you. They are professional, dependable, honest and knowledgeable. I had a small patio project that only required a half yard of concrete. Specialty Concrete came out and poured just what I needed, and I only paid for what was used. Love it!